I knew I would see hardship when I came to Haiti. If you’ve been here before you’ve seen the desperate poverty, the pain and you’ve heard people tell you bluntly that they are hungry. When I moved here — and especially when I was able to spend a month in a mountain village with a family — I was prepared for the tough times I would witness up close and personal. What surprised me was the tenderness. It was everywhere, tucked into ordinary moments on what to me were extraordinary days. 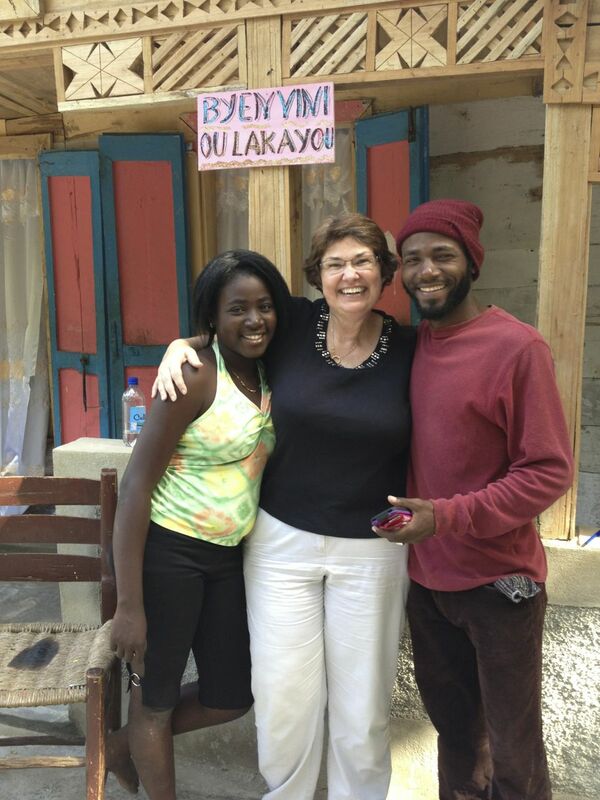 From the start, I’ve been embraced in Haiti. From my first weeks staying at Trinity Lodge to my time in my apartment on Delmas 75, my friends both old and new have taken me in, advised me, fed me, shared time and jokes with me. One glance, one “bonjou!” and I receive huge smiles and greetings. The patience with my faltering Kreyol alone is enough to earn them great praise from me, but the Haitians go so much further. They assure me that I am at home. It was most quickly and thoroughly evident in Cherident, though. In my last post, I shared with you how naturally and immediately I was brought into the Celestin family. And throughout four weeks, I was given a front-row seat to life in rural Haiti — not all of it perfect, of course, but with moments of grace tucked into the most ordinary occasions. Herns cutting his father’s hair. Herns is the second born in the family of eight children. 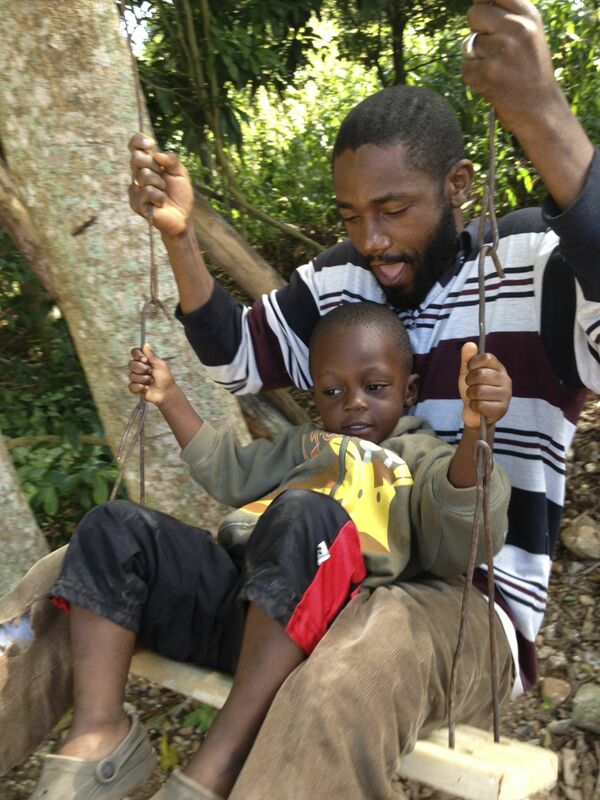 He is 32, and he and his wife, Jennifer and their 2-year-old son, Barns, live in Port-au-Prince. He is trained as an electrician, and in addition to other work when he can find it, he teaches in a technical school. He is a natural teacher — patient but demanding. I know that he looks for the best in others because he often tells me he finds it in me. And this is on the days when my best was not always apparent. As you know, each of Papa Luc’s children traveled up the unforgiving road to Cherident during my month there — just to spend time with me. It was expected. I would have called it an obligation had the tables been turned — in the grace that is Haitian hospitality, they called it a pleasure. And Herns was there with me from the beginning and occasionally throughout my time there. Kreyol lessons sometimes were more formal, but much of it consisted of me listening and watching daily life. One evening shortly before dusk, as neighbors dropped by to visit, Papa Luc pulled a wooden chair out into the courtyard, and Herns stood behind him combing and cutting his hair. He used a blue plastic brush, then carefully trimmed Papa Luc’s hair short with a comb that had a razor blade tucked into the teeth of the comb. Slowly, carefully, tilting his father’s head this way and that, Herns shaped and trimmed and straightened his father’s hair. All the while, the neighbors and Papa Luc and Herns told stories and laughed and enjoyed the natural rhythm of conversation. As dark approached and the job was done, Herns brushed off his father’s shoulders, and Papa Luc replaced his ball cap. It was an ordinary moment in an extraordinary place. The teenager and the sick little boy. Barns was sick with a bad cold. Every day and night, his parents gave the boy medicine, which must not have tasted too bad because he didn’t fight the spoon full of syrup. But the cough continued. One morning when I realized he wasn’t running hither and fro, I asked where he’d gone. His big cousin, Son-Son had taken him to the clinic, his mom told me. About two hours later, Son-Son, 18, walked back home with a handful of medicines and the boy on his shoulders. That afternoon, I sat on the porch with Son-Son beside me, having one of our many conversations about Scripture, Kreyol, subjects we like to study or music. On his lap, sat a grumpy toddler. Folding the little boy’s arms and legs into a comfortable position, Son-Son murmured to him. Barns’ crankiness subsided, and when I looked again, he had fallen into a deep sleep. 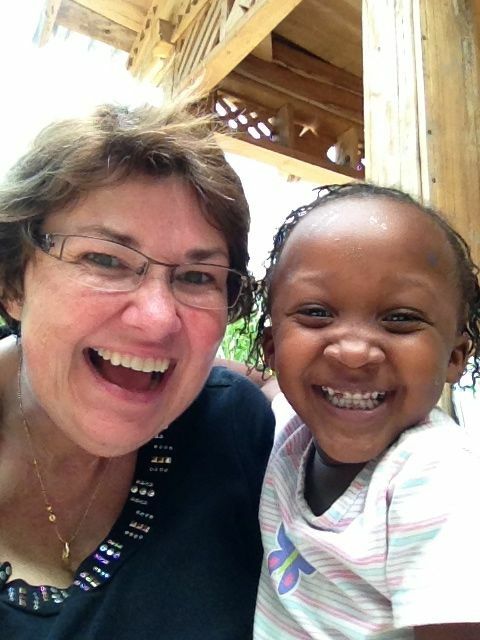 “Excuse me,” Son-Son said to me in Kreyol, standing carefully and taking the child into the house. Another very ordinary moment — but my heart melted just a little. One morning, Herns came home from Papa Luc’s shop where he’d sanded and drilled holes in a wide board. With a huge smile on his face, he set to work building a swing for the children. And there are others. Every day. With every connection I make here, there is a neverending thread. My friends and family call me, text, visit me. They ask if I am eating, if I am sleeping well. My favorite question is one first posed by Goursse, an Episcopal deacon responsible for several churches in and near Cazale. “Did you dream?” he asked me one morning. “What did you dream?” I would end each good night with “Make good dreams,” and the sentiment was returned. They still ask, and I tell them about my dreams and ask about theirs. Haiti is a land of many challenges, but do not — even for a moment — believe that dreams are forsaken here. Whether the nocturnal wanderings of the mind or the ever-present hopes and plans for tomorrow, dreams are essential here. And like the strong hands I often found ready and waiting for me on many long walks on narrow, rocky paths across the hills of rural Haiti, we will count on the power of dreams. And the power of tenderness among our brothers and sisters here. And wherever you are, friends. Dream — and make good dreams. And notice the tenderness in your days as well. Posing with Felix, Papa Luc, Herns and Withney. Welcomed by Esther and Herns — this photo was taken within minutes of my arrival. We were just a little bit glad to see each other again! 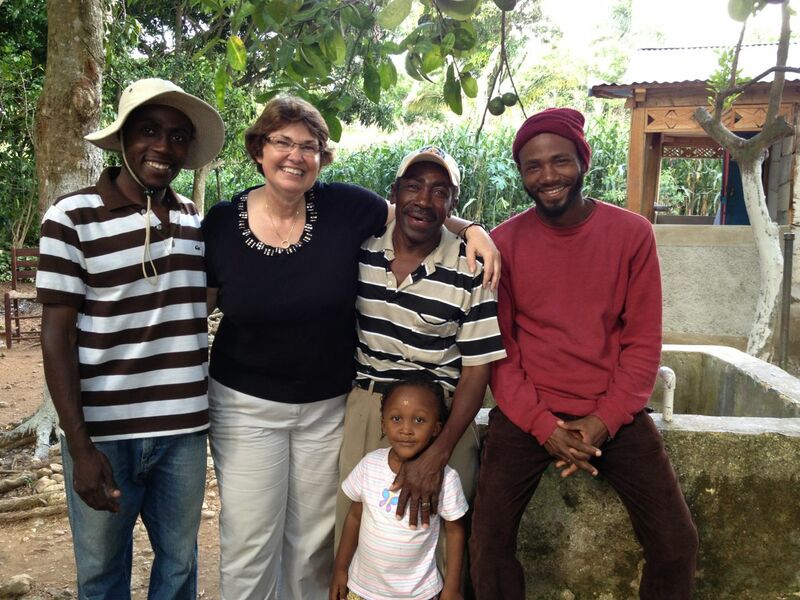 June 10, 2013 – I left Port-au-Prince in the morning and headed toward Grand Colline. Grand Colline is a region in the mountains of southern Haiti. But before I got there, I wanted to buy a NatCom SIM card in Port-au-Prince. That took a while. About two hours, in fact. By the time we got going, it was close to noon. Rodrick was our driver. He is a neighbor of my PC(USA) colleague and friend Suzette Goss-Geffrard’s.We came in Suzette’s truck. I took a small suitcase, a backpack and a computer bag with a camera bag inside. With that in the backseat and me, it was a bit crowded. I had only spent two nights in my new apartment, but I was glad to get out of the city. I realized this as we were driving out of town. I was moving! I was going to the countryside. It felt good. We stopped at the main headquarters of NatCom in PAP, but they didn’t sell micro SIM cards. So we were directed to a neighborhood to another shop. Nope. Then we stopped at about four other NatCom dealers on the street. Finally someone directed us to another office. That’s where it took two hours. Everything in Haiti takes longer than you would expect. Patience and tolerance are not luxuries here. They are essential for your peace of mind. I wasn’t really minding the delays, though. The closer we got to Cherident, the more I could feel my anxiety rising. When we got to Leogane, we stopped for lunch at a small restaurant that served outside under a canopy. We had a great Haitian meal. Then we went to a small market to pick up a few things, and finally we started up the southern mountains. A little ways out of Leogane toward Grand Goave, we turned and headed up a good road. Not far up, we turned to a rocky, dusty road and toward Grand Colline. Grand Colline is a region of Haiti. It covers the mountains in southeastern Haiti and includes Cherident, Trouin, Bainet, Meye, Bodin, Blocos and Grand Goave. Cherident is the place where Tinkling Spring Church has partnered since 1990. I have been here twice before, and I love the community. So when I learned that I needed to find a family where I could stay for a month to study language, I asked my friend Ancy Fils-Aime if he knew anyone who would take me in. He in turn asked Papa Luc Celestin, and the entire Celestin family has taken me into the family. I didn’t know any of them except for one of Papa Luc’s sons, Felix. He and his wife have an adorable little girl named Withney and I had visited them once on a recent trip. But I’d been in Haiti long enough to give up on the idea of expectations — expectations mean greater surprises, because trust me, I know very little of what is to happen. And showing up in Cherident was about to give me a greeting I could never have imagined. When we drove along the mountain road — up and down and around steep curves, some of them on the edge of the hillside — it finally began to feel familiar. Then just at the edge of town, Suzette saw a sign on a post that said “Welcome!” Roderick stopped the truck, and when he did, Herns Celestin came to the truck and greeted me. I thought he was Felix, and he didn’t correct me. He jumped in the truck and directed Roderick to drive along the path between a cornfield and a wooded area toward the house. Finally we arrived at the house, and I knew exactly where we were. I’d visited here with Page so she could bring gifts to Withney, Felix’s little girl. So sweet! And it got better. A sign greeting me — made with glue and glitter — was above the door. Byen vini – Ou lakay ou! Welcome to your home. A bit later, Papa Luc walked up the path to the house. He embraced me as if he had always known me, and I felt the same way. More visiting and introductions and sweet kisses from Withney, and I knew that I was home. I was there to learn Creole, they knew, so the lessons began right away. I mean right after Suzette and Rodrick drove away. Herns and I settled into the kitchen chairs in the lakou (yard) and we went over what I already knew. The first “lesson” was about what foods I like. This was tricky – they wanted to know what I would like to eat, so I told them. Diri ak pwa (rice and beans), banann (plantains), pikliz (a spicy cole slaw), kabwit (goat) and dlo (water.) Not long afterward, I was treated to the the seat at the head of the table in the dining room of the small house. Herns brought a small basin of water for me to wash my hands, and a towel. And the table was set with dinner – diri ak pwa, banann ak pikliz, kabwit and, of course, dlo. The meal was extraordinary. The smile never left my face, and though I was growing weary from the busy day, I was glad with Herns told me that we would finish the day with about 15 minutes of prayer. When Papa Luc called for the rest of the family to come in, we began with a hymn, and I was able to sing along with the words in Chants D’Esperance, a complilation of gospel songs in Creole and French. Following the hymn, each one prays their own prayer aloud and at the same time. Then another prayers recited, and it was time for the chosen Psalm. Esther opened my Creole Bible to the right page and pointed to Psalm 7. And right there, in front of a family I’d just met, me, with my tentative Creole, read Scripture aided in part by Papa Luc who knows the words by heart. This would be the beginning of an intoxicating chapter in my life — and I do not just mean in Haiti. What would happen in the next weeks would change me forever.